July 13 is National French Fries Day. French fries are a common fixture of fast food restaurants all over the world. The origin of fries is unclear as Belgium and France both claim ownership of the invention. President Thomas Jefferson is believed to have introduced America to this dish. “Potatoes served in the French manner” were served at a White House dinner in 1802. The first printed mention of the expression “French fried potatoes” dates back to 1856. In France and French-speaking countries, they are known as pommes frites or simply frites. French fries are also referred to as French-fried potatoes, fries, finger chips, or chips. They are elongated pieces of deep-fried potato which are typically served hot. Some restaurants offer fries cut up into unusual shapes such as crinkle cut fries, waffle fries (also known as criss-cross fries), tornado fries, or curly fries. French fries can be either crisp or soft. They are typically salted and often served with ketchup, mayonnaise, barbecue sauce, honey mustard, ranch dressing, or other sauce on the side. 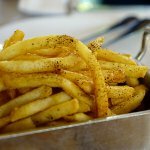 French fries can be consumed either as a snack or a side dish, they are rarely served as a main dish. To celebrate National French Fries Day, go out to your favorite restaurant or diner. If you feel like cooking, you can make fries yourself. Just don't go overboard, because deep fried foods are not healthy.